I’m a musical mom and love that our home is continually filled with music. I hear my son singing or playing guitar in the basement, my daughter practicing piano, another working on her musical theater audition son, and another son practicing cello. My youngest daughter is dancing around making up her own songs! But, I know other mom may need a little help in this area, so here are 5 totally fun ways to bring more music into your homeschool. Now, you can get really elaborate with this one and buy a piano or rent some violins to start taking lessons. But, there are lots of simpler ideas! 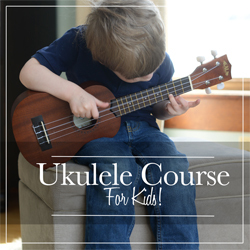 Have you thought of learning to play the ukulele, or an ocarina, or the recorder? You can even use the brand new Still Singing: Hymn Stories for Every Season to learn to play hymns on a slide whistle! It’s so fun to have a family movie night. Perhaps you already do this. We have had some fun times watching some newer animated musicals such as Sing!, Zootopia, and Tangled. But, if you haven’t already, it’s time to introduce your kids to some classic movie musicals such as Annie, The Music Man, and Newsies. See the Top 10 Musicals to Watch with Younger Kids here. Or, if you have teens, see 15 Must-See Movie Musicals for High School Students. When was the last time you went to a live music performance? There are so many different options of music styles, venues, and even ticket prices. Check out some free ones at “concerts in the park” during the summertime or at your local library. Another option you may not have thought about is at your local high school, community college, or university. They will have choir, band, and orchestra concerts all throughout the year, and probably some musicals or operas as well. And, then, of course, there are community and professional theaters where you can see the best of the best! Music and dance are intimately interwoven. How fun would it be to take a family dance class and learn a new style like ballet, tap, or ballroom dance together? Contact your local dance studio. If they don’t have it available, maybe they’ll consider adding a class if you can get a few more homeschool families to join you! You might even be able to hire a dance teacher to come to your homeschool co-op to teach some families together there. When our kids were young, we used to sit around and pull out the songbooks and hymn books. My husband would play the guitar, and my kids would play some conga drums, bongos, and the tambourine while we all sang. It’s been a long time since we did that. I think we need to bring that tradition back! My new online music course called “Great Hymns of the Faith” (which will launch August, 2018) includes videos to teach each hymn so that you can sing in 4-part harmony. Wouldn’t that be so fun to do with your family? 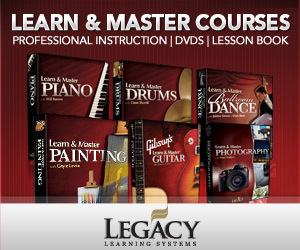 How will you bring more music into your homeschool this year? Please share in a comment below. Will you learn an instrument or start singing together as a family, go to some performances, dance, or enjoy some musical family move nights? Maybe, you have a different idea. I’d love to hear your thoughts and suggestions! Perhaps you’ve already started your year, or perhaps your school year never ends because you school year-round. Either way, what homeschool mom couldn’t use a little extra money for homeschool curriculum or resources? I’ve gotten together with a great group of homeschool bloggers to do just that – give 2 moms a gift card they can spend on their homeschools. How does $250 sound in helping you buy curriculum, books, games, puzzles, or whatever educational supplies you might need? Two people will win a $250 gift card to Rainbow Resource Center!! We know homeschooling can put a financial strain on families – whether it’s from living on a single income or buying curriculum for multiple children. Yes, the financial aspect of it can be very stressful. Our hope is that we can bless a couple of homeschool families (although we wish we could bless many more) so they can buy the curriculum and supplies they need for their school year. To enter for your chance to win, simply use the Rafflecopter form below to enter. Now I know that is quite a few entries for you, but each of these bloggers generously chipped in their own money to bring you this giveaway, so I hope you will take the time to do all of the entries. And hey, the more entries you do, the better your odds are of winning! I would pick some fun books for my son to read just for the fun of it and maybe some games. I would also look for any science project kits. He loves to do science experiments. I have a long list of things I would love! I’d definitely get AAR level 2, spelling, a math workbook for my little one, and some new handwriting books. Then I’d look at some science kits or history projects to add some more hands-on fun to our day. Thank you! I have a long list for Rainbow Resource. With two kids in high school needing different things, I would choose Write Shop and the online Web Design class. Thanks for the chance to win! I would choose art curriculum and supplies for next year, and some ancient history resources. I love Rainbow Resource Center. When I first started homeschooling I called them every week for advice(they knew me by name and there was only one consultant at the time) I think I would buy art supplies with the money if I got it because it is not something I always remember to purchase. Thank you. Art supplies and books! So many cool things over at Rainbow Resource Center! Thank you for the giveaway! I’d probably buy games if I won, since I’m looking for ways to make learning more fun! I’d get math manipulative kits for kindergarten and 1st grade. I would pick some history resources. I’m excited about trying to bring more fun into this school year (encourage a love of learning) and would definitely look for resources that fit with that. I’ve had my eye on Mapping the World with Art for a while now. To be honest i haven’t looked at anything from Rainbow Resources for probably 5 yrs or more. We have been just using what ever was given to us. I do remember that Rainbow had quite a lot of different curriculums and schooling items at reasonable prices so i am excited about this giveaway to be able to choose some items that i think will be useful to my children and not just what someone gave us. Thanks for the chance to win! I’d have fun filling up a cart with art supplies, science tools, and games for our homeschool! I want to listen to more of the classic composers together! I need to just make it a priority! Gosh I don’t know where to begin. I would purchase Math Lessons for a Living Education for my youngest 2, Principles of Mathematics 1 & 2 for my 10th grader, and for my senior Jacob’s Geometry. We also still need the guide from The Classical Historian for American Gov and Econ. So much more, Rainbow has always been a great resource for us. I would buy some of the nonfiction books I’ve been eyeing, as well as some chapter books for my son. With the rest I’d probably get more science materials. I would like to start watching musicals with my family. I like the idea of the musical movie night. Our older ones love musicals but our younger 5 haven’t really been introduced to them. Would be wonderful for sibling bonding as well. A win-win! As for what I would buy if I won… I’m honestly not sure yet. I am still working to implement Charlotte Mason methods, so probably some fine arts resources and nature resources as well. I would love to pick some books to start my son reading! I would buy resources for my autistic 6 year old daughter. I would choose some art supplies and electives. Well, my wish list on Rainbow Resource is pretty extensive! 😉 But I’d start with much needed math, grammar and writing curricula for this school year. I’d use the giftcard on buying learning games or crafts. If I won the gift card, I would purchase the All About Reading Level 4 and as many All About Spelling levels atarting with 3 that I could but with what I have left. Hi! If I win, I will use the giftcard to purchase some Apologetics curricula and Science curricula/equipment! Thank you for the drawing opportunity. I would buy more Beast Academy, possibly Megawords, and hopefully a bunch of other great stuff! I would love to buy my history curriculum! If I were to win I would get some reading/spelling resources. I would start buying next year’s curriculum! Thank you for the chance! I would purchase games, puzzles, construction toys, outdoor toys, and books.